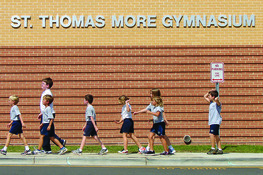 Saint Thomas More Catholic School makes every effort to serve students with learning needs. While we are able to provide many needed accommodations, we are not able to provide separate setting for, or live read aloud of, classroom tests and exams. Upon receiving the student evaluation paperwork, the Resource teacher will review the information contained in the evaluation and draft an initial Student Accommodation Plan. The Student Team which consists of parent(s), teacher(s), and Resource teacher will then meet to review the Student Accommodation Plan, the evaluation, and discuss any additional accommodations needed for that student’s success. The Resource teacher will compose a formal STM Student Accommodation Plan which is then provided to the parents and classroom teacher for approval. After finalization, the STM Student Accommodation Plan will be distributed to and implemented by all involved parties. Parent(s) who have concerns about their student’s achievement should first contact the child’s teacher. Teachers who have concerns about a student’s achievement should first confer with the child’s parent(s) in order to discuss concerns and strategies to aid the student’s progress. Students who do not have an educational evaluation on file, but who continue to struggle with the curriculum may be referred by a parent or teacher for assistance to the School-based Team. The School-based Team, composed of the student’s teacher(s) and Resource teacher, will discuss areas of concern, review the student’s records, and develop general goal statements. Teachers or parents should make initial contact with the Resource teacher. This will begin the process of monitoring the child’s performance and collecting additional data. An informal observation and assessment may be completed as part of this process. The Student Team, composed of the student’s parent(s), teacher(s), and Resource teacher, will solidify the goals, create action steps and implement classroom interventions to aid the student. Action steps towards the goal will be carefully implemented in the regular classroom for approximately 4-6 weeks. A follow-up conference meeting time will be established. At the follow-up meeting, the Student Team will convene to discuss and choose one of the following options: the success of the interventions, the need to try alternative interventions, or the need for further evaluative information in order to best serve the student’s needs. Educational evaluations are completed through a licensed psychologist. Evaluations are available through Chapel Hill-Carrboro Schools. This can be done after the above described process has been completed. Parents are always welcome to seek an educational evaluation through a private practice. This route does not require the student assistance process. Saint Thomas More Catholic School will make every effort to provide an appropriate education to every child.